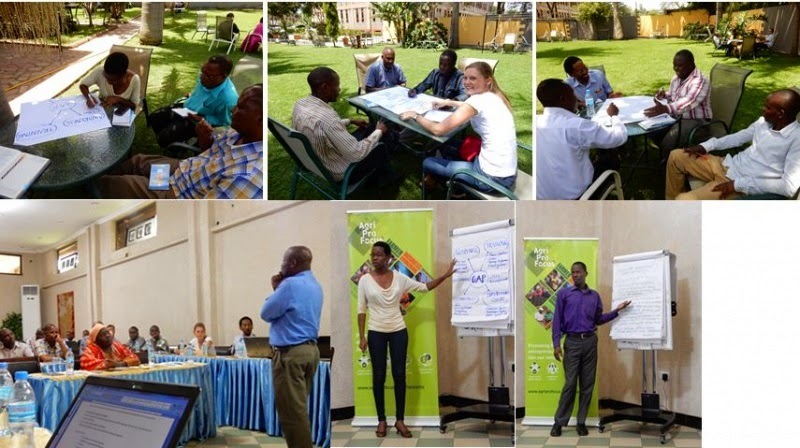 On 5th February, 2015, actors along the onion and garlic value chains met to learn about the findings of a recent value chain study that was jointly commissioned by Trias, TAHA, MVIWATA and AgriProFocus Tanzania on Onion and Garlic value chains, specifically focusing on Manyara and Arusha production zones. Among other objectives, the study aimed at Identifying; all (main) actors in the value chains, the main market outlets for the 2 value chains, the obstacles and needs that the different players in the chains face, requirements of the different VC actors, moreover it aimed at profiling the types and nature of relations between different actors along the 2 value chains and determining the main costs and expenses of each actor and their profit (simplified gross margin). The study has incorporated the views and responses of different actors along the two value chains, including, Farmers, Traders, Agro-dealers, Supporting NGOs, BDSs, & LGAs and has provided recommendations on the various constraints facing these value chains, moreover, these recommendations present a number of opportunities for value chains actors including agro-dealers, processing companies, financiers, research institutes, government institutions to further support Onion and Garlic farmers in Arusha and Manyara regions. Generally, Onion Value chain actors have listed a number of challenges that constrain their farming activities including; poor quality of seeds, Inadequate water for irrigation, limited knowledge and information on plant protection and plant nutrition, high costs for (hired) storage and store structures and post-harvest losses including moisture and shrinkage and also limited access to finance. Garlic value chain actors as well have listed similar challenges that constrain them, however, the absence of Extension officers who are specialized in Garlic farming is also a serious problem to farmers. During the discussions of the study findings, one of the Onion farmers from Arusha region, Mr. Edward Justine, urged agro-dealers to further invest on reaching out to farmers in the fields through methods like mobile agro-dealer shops and demo plots. ''Farmers have to be able to tell the difference between the performance of a local seed and hybrid seed, agro-dealers should set-up demo plots close to the farmers fields and create awareness on the benefits of using improved seeds''. This point of discussion follows the study findings which revealed that there were serious knowledge/information gaps amongst farmers. For instance, onion farmers use up to 12kgs of local seeds to produce seedlings for one acre, whereas, one of the interviewed Agro-dealers, Balton Tanzania Ltd states that, if farmers use improved seeds, they would only use 1kg of seed per acre. More details of the study and the findings are included in the attached PowerPoint presentation. The full study report will be shared soon. Agro-dealers urged to move services closer to onion and garlic farms.